Cincinnati has nearly seen the end of brownouts in fire stations, with the addition of 41 new fire recruits who graduated last week and a department overtime budget of $2.5 million, Mayor John Cranley said in a city hall press conference Monday. The new recruits will reduce the number of brownouts of fire equipment from five per day to anywhere from two to zero per day. 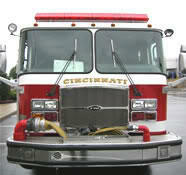 But Cranley and Fire Chief Richard Braun said in a city hall press conference Monday that is not good enough. “We need at least another recruit class before we can get to the level of no brownouts,’’ Cranley said. Braun said he “will be comfortable when we have none.” A report put together by Braun for the mayor and city council said an additional recruit class of 50 this spring would bring the fire department to a full complement of 841 firefighters. Braun said he needs those additional firefighters to eliminate brownouts altogether. To pay for the recruit class, Braun has applied for a federal grant – the same federal grant that paid for the recruit class that graduated Friday and the recruit class of 2013. He expects an answer in about a month. The federal grants pay also pay for the newly-trained firefighters’ salaries for the their first two years of service. The $2.5 million in the fire department budget has been holding the daily brown-outs to five. The new recruits will reduce that. But the overtime money only lasts through the end of June. On Monday Cranley, council member Christopher Smitherman, who chairs council’s law and public safety committee; and council member Kevin Flynn, the committee’s vice chair, said they will be going to the full city council next week to ask for another $2.5 million to continue the fire department overtime. “We would expect our city administration to come up with a budget of $2.5 million for overtime,’’ Smitherman said. Cincinnati Mayor John Cranley and Council member Christopher Smitherman are preparing to announce plan to cut back and possibly eliminate fire department brownouts. The mayor's spokesperson, Jay Kincaid, says the plan will reduce brownouts from five per day to fewer than one per day or potentially none. Kincaid says a report is expected to be released by Sunday afternoon and a press conference is being scheduled for Monday morning to release the details.